Does the Clark County Family Court Consider a Child’s Wishes When Parents Cannot Agree on Critical Decisions? This is the next post in my series discussing issues that the Clark County Family Court will and will not intervene in when two parents cannot degree on parenting decisions. My last post explained when a Judge may make a ruling if two parents are having a disagreement over medical treatment. In this post I will explain how a child’s age may be a factor as to whether or not a Judge will hear a case and how the Court may rule. The older a child is then the more consideration a Judge will give with regards to the child’s wishes. For example, if two parents are arguing over where a child should go to school then a Judge is far more likely to side with the wishes of a teenager than a child who is in elementary school. Whenever a Judge is tasked with making a decision he or she will attempt to determine the best interests of the child by factoring in issues such as educational opportunities, social well-being, access to areas of interest, etc. If a child is older and has established social contacts at a certain school, or has a well developed interest in a certain activity that another school provides, then a Judge likely will consider these wishes. During the course of this series I have touched on issues that a Judge would refuse to rule on. These include differences in each parent’s dietary plans, religion, non life threatening medical care treatment, etc. As a child ages into a more mature teenager, the Court system would still refuse to hear parenting disagreements of such a nature. However, if two parents have drastically different lifestyles, and the child identifies with one over the other, there may be grounds to file for a change of custody. Many Judge’s will consider a child’s preference when it comes to which parent the child would like to live with as the child reaches their teenage years. This is assuming that both parents have demonstrated that they are generally responsible parents and are each suited to providing an appropriate environment for the child to live in. 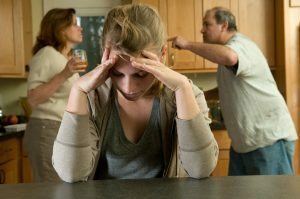 If two parents have been bickering over certain issues over the course of a child’s life- for example, one parent is drastically stricter with curfews, parents have different religious views, cultural differences, house rules, etc., by the time the child is older, then they may have formed their own beliefs. If an older child can make the argument that one living situation is a better fit for their personality and well-being, a Judge may well side with the child, thus ending a lifetime or arguments. When two parents have different ways of living, so long as the child is not being harmed, it is always recommended that parents work out the issue privately and avoid going back to Court at all cost. However, if neither parent can compromise, the child is older, and has a clear preference about how they wish to live, it is possible to ask the Court to change the custody arrangement. Contact our office today for a consultation to discuss the matter further with a Las Vegas child custody attorney.